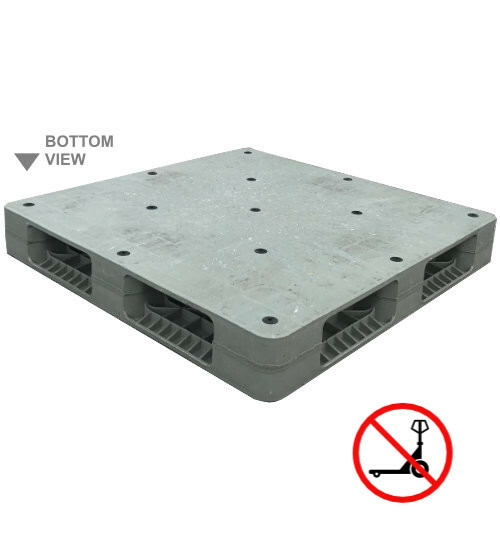 Please send me a price for the UP-1111-FP-RBR-R4 43x43 used plastic pallet. A reversible plastic pallet is always right-side up. Increase productivity with the double-sided UP-1111-FP-RBR-R4. This stackable plastic pallet has a strong reversible bottom deck for safe double stacking of multiple plastic pallets with product. This rackable plastic pallet works in warehouse racking systems by using support from the reversible style bottom deck. Our used UP-1111-FP-RBR-R4 plastic pallet offers the expected reliability and quality of long lasting plastic at used pallet prices. Plastic pallets like the UP-1111-FP-RBR-R4 are lightweight and durable. Its uniform length and width provide ease of use and safety. One-way plastic pallets like the UP-1111-FP-RBR-R4 let you send it and forget it making this a competitive alternative to pallet return options. Get more turns using the UP-1111-FP-RBR-R4 multi-trip plastic pallet and easily win back startup costs with durable and reliable plastic. Use the UP-1111-FP-RBR-R4 captive plastic pallet in closed loops to satisfy in-house reusability requirements with the reliability of plastic. Unique double-sided pallet features the same closed deck design top and bottom. Grommets installed top and bottom. Is the UP-1111-FP-RBR-R4 the right pallet for you?